Today we present you with a Hands On, First Look Preview of AE Bounty from Darkson Designs, makers of AE WWII. The rulebook is now complete, and I am told the game should be shipping any day now. 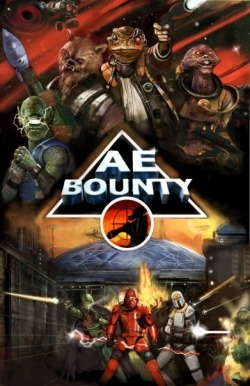 Utilizing the core game mechanics from AE WWII, AE Bounty is an all new sci-fi game where Bounty Hunter, Pirate, and Mercenary forces can be created with as few as two models per side, or as many as fifteen. Therefore this is a skirmish level game, and a ton of models aren't required to get the most out it. 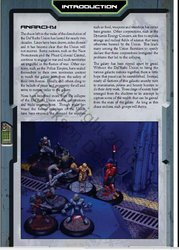 The scale utilized is 28mm, and they claim that the game is compatible with most other 1/48th scale models and miniatures. Instead of putting together an all encompassing overview type preview of the entire game, I'm going to preview just the Crew Composition part of the game for you today. The first thing you need to do is decide which Faction you want to play Bounty Hunter, Pirate or Mercenary. There's a number of different templates to be used in crew composition they are... Two Man Crew, Veteran Crew, Standard Crew and Large Crew. A Two Man Crew is made up of Two Elite units. Two Individuals can be upgraded to Heroes, and they can select up to 3 Dirty Tricks, and like most crews, the template allows the flexibility of being allowed to drop an Experience Level (EL) of a member, for a lower level alternative (Elite to Veteran, or Regular to Green, etc), and to select another Dirty Trick, or an upgrade by one level to another member, or another Hero upgrade. 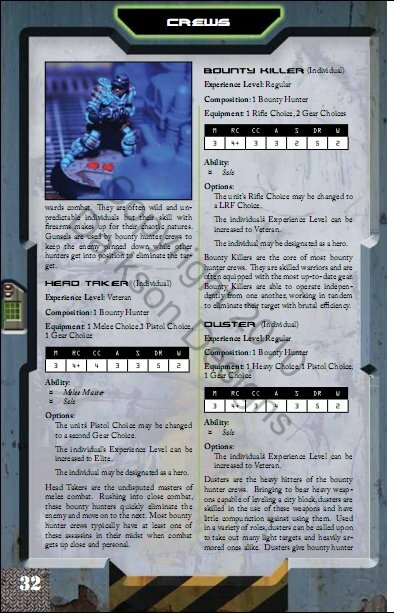 The Two Man Crew also has a Special rule, which allows specific selection restrictions to be ignored when it comes to the number of units required to field a unit, for instance Pirates normally require a Crewman for every Non-Crewman unit selected. The Standard Crew Template utilizes 1 Veteran, 3 Regular and 1 Green Unit, one individual can be upgraded to a Hero, one Dirty Trick can be selected, and they also have the option of dropping an EL on one model, in exchange for another lower level alternative, then to upgrade another by one level, or to upgrade to one more Hero, or to select an additional Dirty Trick. A Standard Crew can be as few as 5 models, and as many as over a dozen. Once you have selected the Crew from the templates provided, you now move on to Equip the Crew. This is predetermined by the units you've selected. 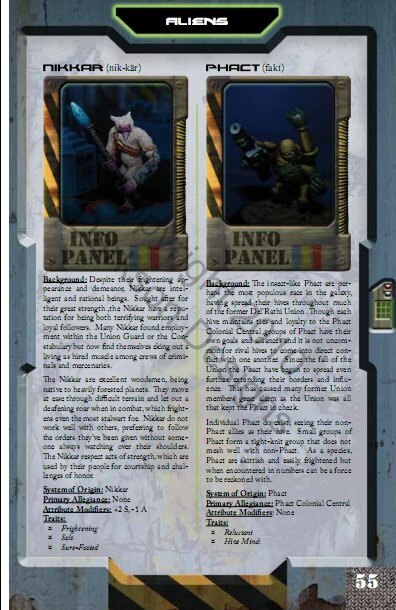 For instance, I'm building a Bounty Hunter faction Standard Crew type. 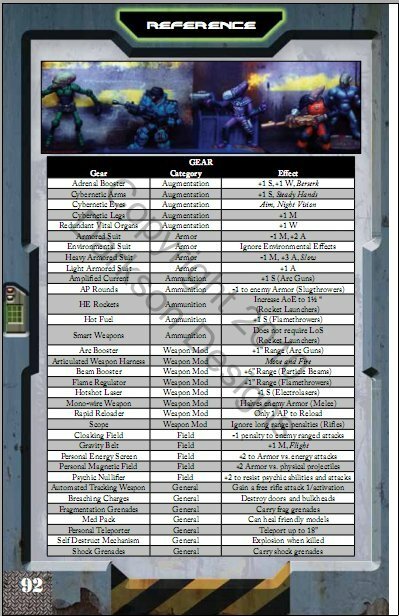 Therefore when I select a Veteran Experience Level Exterminator from the BH Faction units available, I'm now allowed to select 1 Rifle choice, 1 Pistol choice and 1 Gear choice from the Weapons and Gear list. 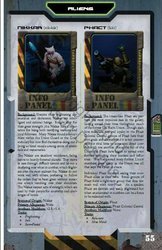 The Exterminator also has the option to swap his Rifle choice for a Melee weapon choice, and an Alien type cannot be added to this unit. Once your crew has been Equipped it's time to select the Alien Race type for your Crew members. 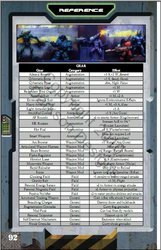 There's a little over a dozen different Alien Race types to choose from, and they add additional Attribute Modifiers and Traits, further defining your crew's capabilities. Now you need to select the type of Hero(es) which will be included in your crew. A little over a dozen unique Hero types are available to choose from, each of which also add further modifiers and abilities. Lastly you select the number of Dirty Tricks your crew is allotted from a list of close to two dozen different Dirty Tricks. 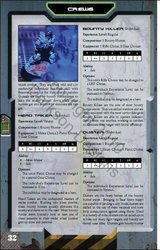 The Dirty Tricks remind me a lot of the spells, special abilities and Feats you'd find on say a Warmachine character stat card. A Dirty Trick can be as simple as Coordinated Attack, which allows you to activate two units at once, instead of the usual single unit at once activation scheme which the game utilizes. A Dirty Trick can be as nasty as Out of Ammo, which allows you to declare an enemy unit to be out of ammo once per game, therefore they can't make any ranged combat attacks at all during the next game turn. Having loads of flexibility when it comes to creating your crew, and being a points-free system is what I think will help ensure, that AE Bounty becomes popular among skirmish gaming enthusiasts. As you can see the options are many, and options are always a good thing, but it's not too complex, or overcomplicated either. That pretty much covers creating a Crew for AE Bounty. All of the individual templates for each crew member is predetermined, aside from weapon & gear selection, and race, so it feels a lot less like rolling up a character, which I like a lot. There's very little bookkeeping. The Experience Level also determines how many Action Points (AP) you have per turn, Green = 1 AP, Regular = 2 AP, Veteran = 3AP and Elite = 4 AP. At bare minimum the game also requires no more than a D6 die, a measuring tape/stick, suitable models to define your forces and a 4X4 playing surface. 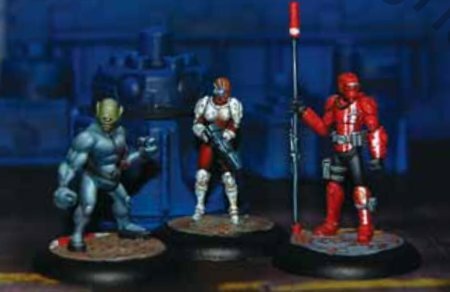 While Darkson Designs is releasing an entire line of models to support the game (which we should be covering soon), you can use any existing sci-fi models you may have to play the game just the same. 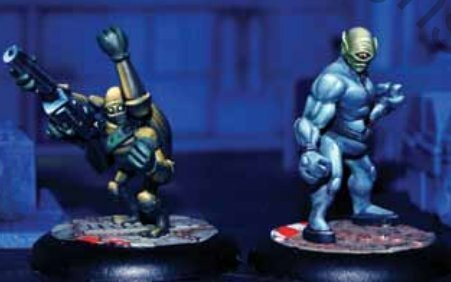 Being a game which you can choose to play with your minis, their minis, or a mix of both make this a very versatile game too, and most importantly one with a very minimal initial investment. 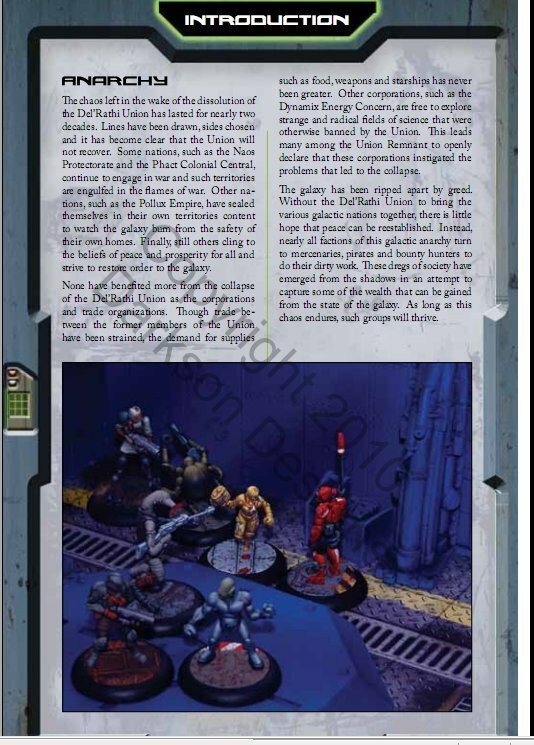 The rulebook will carry an MSRP of $24.99, and is 99 pages. Keep an eye on WarGameGuru for our full review, and more on AE Bounty in the coming weeks. Until then you can check out the Darkson Designs website below for more images of some of the models they'll be releasing for AE Bounty.